With the Gardall 1612-2 you will be making a worthwhile investment in the protection of your company records. With its 2 hour fire UL rating up to 1850F you can rest assured that your valuables will remain intact should a fire occur. Security features include two live locking door bolts to prevent forcible entry, heavy duty hinges, a hardplate to deter drilling attacks, a strong door and thick walls and a UL Group II combination lock all of which will give you and your company the assurance that what's inside will remain secure and intact. 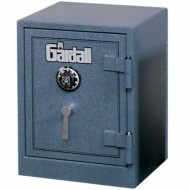 Gardall 1812-2 is a heavy duty safe with two hour fire protection. Please contact us if you need indoor delivery on this 313lb safe please call 877-442-9964 or email customer service cs@thesafestores.com. There is an extra charge. Maintaining the safety and security of your company records is important, but it's also vital to make sure that they stay intact too. This can be accomplished with the Gardall 1812-2 2 hour fireproof safe that has a UL rating for two hours of fire protection for temperatures up to 1850F. There are also security features that will prevent any would-be thieves such as a 4-1/4" thick door with an anti-pry design and 2-1/2" thick walls, a center bolt down hole for added security, a hardplate to stop drilling attacks, five locking door bolts for extra security and heavy duty hinges that will deter prying attacks. In order to protect your company records you need a safe that you can rely on. This is where the Gardall 1818-2 steps in and is a very effective solution for your needs. This safe is UL rated for two hours of fire protection up to 1850F. Security features include 2 1/2" thick walls and a 4 1/4" thick door with a chrome-plated handle with shear point that will stop the safe from being forced open if there is an attack on the handle, five massive locking door bolts and an independent re-locker. All of which have been designed to increase security and minimize theft. 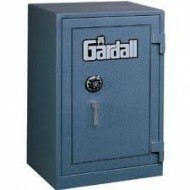 Gardal 171718-2 heavy duty, two hour fire protection safe provides great security. Please contact us if you need indoor delivery on this 487 lb safe please call 877-442-9964 or email customer service cs@thesafestores.com. There is an extra charge. The Gardall 171718-2 2 hour fireproof safe has a manufacturer rating for two hours of fire protection up to 1850F, which means that you can rest assured that any important documents inside the safe will remain intact in the event of a fire. The safe features a center bolt down hole for easy and secure installation, a UL listed Group II combination lock, five live locking door bolts, a solid chrome-plated handle with shear point to stop the safe from being forced open and strong thick walls and door with a recessed anti-pry design. 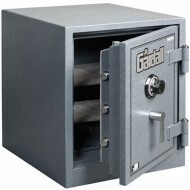 Gardall 2218-2 is a two hour fire protection safe. Please contact us if you need indoor delivery on this 525lb safe please call 877-442-9964 or email customer service cs@thesafestores.com. There is an extra charge. The Gardall 2218-2 2 hour fireproof safe will give you the peace of mind to know that your valuable documentation and items remain safe and secure from thieves and unharmed by fire. Along with fire safety features there are security features too such as a recessed anti-pry design, a solid chrome-plated handle with shear point to stop the safe from being forced open, five large locking door bolts and a Group II combination lock, all designed to provide maximum security. 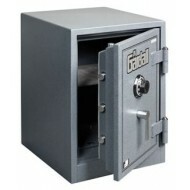 Gardall 3018-2 is a heavy and large two hour safe. Please contact us if you need indoor delivery on this 620 lb safe please call 877-442-9964 or email customer service cs@thesafestores.com. There is an extra charge. Knowing that there are safes to protect your valuables from heat damage and theft will give a person the assurance they need. For the safe to do the job, the Gardall 3018-2 is the solution. With a two hour fire manufacturer rating you can remain assured that if a fire does take place the inside temperature will only reach 350F by the time the outside temperature reaches 1850F. Aside from keeping your contents safe from heat damage the 3018-2 is also an anti-theft safe with a number of features such as five large locking bolts, an independent re-locker, anti-pry door and anchor holes to securely bolt your safe down for added security.